Lewis Hamilton wins the Brazilian Grand Prix. Mercedes driver Lewis Hamilton ensured the Formula 1 drivers' title will be decided in the last race by winning a thrilling Brazilian Grand Prix on Sunday. 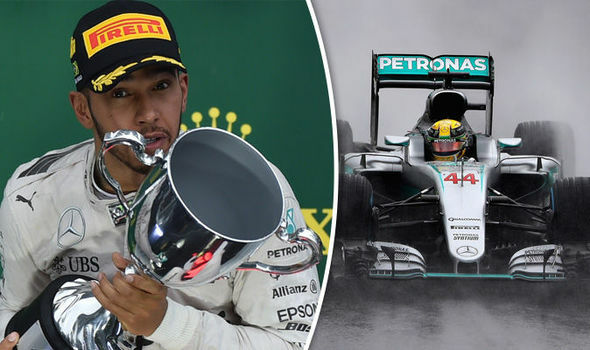 The 31-year-old Briton secured his third straight victory and ninth for the season in treacherous conditions as heavy rain lashed the Interlagos circuit. Organizers ordered two stoppages and five safety cars before Hamilton finally crossed the line first, more than three hours after the race started. Needing a win to secure his first title, Nico Rosberg finished second, more than 11 seconds behind his Mercedes teammate. Red Bull Racing's Max Verstappen was third, another 10 seconds behind Rosberg. Starting from pole position, Hamilton led from the outset and pulled away from his rivals after each restart. His lead stretched as far as 18 seconds during the 14th lap before the safety car brought him back to the pack. "Not too bad, huh," Hamilton said. "I was generally just chilling up front. When it rains it's usually a good day for me. It was tricky for everyone. There were definitely opportunities for aquaplaning, which everyone did. "No mistakes, no issues, no spins. It was kind of interesting to hear how many people were spinning, but I didn't have that problem." The result lifted Hamilton to second in the all-time Grand Prix winners list with 52, surpassing Alain Prost's tally of 51. Michael Schumacher tops the list with 91. Despite Hamilton's late-season surge, Rosberg can still claim the championship with third place or better at the final race of the season in Abu Dhabi on November 27. "It didn't go my way today," the 31-year-old German said. "Lewis just did a great job. It was very difficult conditions and I can live with second for sure." Competing for the last time in front of his home fans, retiring Williams driver Felipe Massi failed to finish after crashing in the 16th lap.